With all the Margraviate of Baden-Durlach Grötzingen 1556 was Protestant. Even the mid-19th century, therefore, lived just 14 Catholic citizens within the village. Only with the increasing industrialization and the influx of many workers, the community began to grow steadily. First, the pastoral care carried by Durlach yet, but the desire for a church grew. Although after the First World War, about 450 believers lived, but still lacked sufficient funds to realize the promise of God's house. So it was decided initially to acquire the former Villa Fritsche, which was built around the year 1900 (photo above). After a renovation, the ground floor was used as a church and a house for the priest to be created upstairs. In October 1920, the first Mass was celebrated in the former mansion. 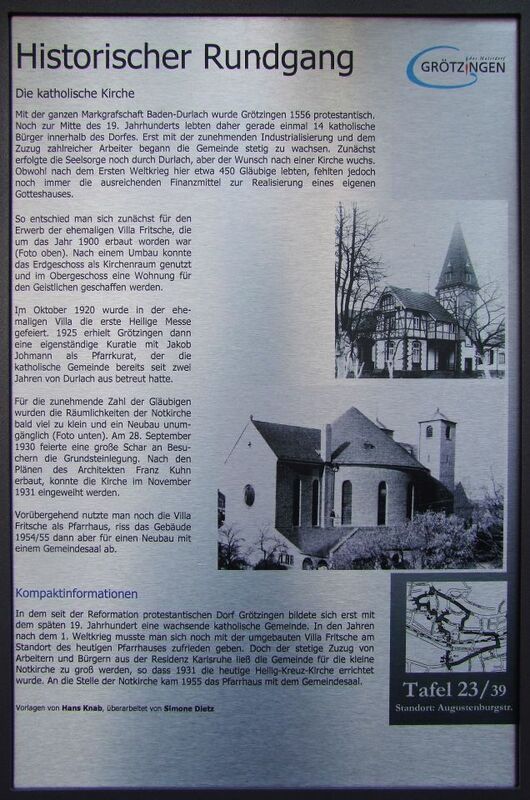 1925 Grötzingen was then an independent Kuratie with Jacob Johmann as Pfarrkurat, who had charge of the Catholic community for the last two years of Durlach from. For the increasing number of worshipers the premises of the makeshift church soon became too small and a new building unavoidable (photo below). On September 28, 1930 a large crowd of visitors celebrated the groundbreaking ceremony. According to the plans of the architect Franz Kuhn built, the church was inaugurated in November 1931. Temporarily we made ? ?use of the Villa Fritsche as a rectory, tore the building 1954-55 but then for a new building with a community hall from.